The potato’s story begins about 8,000 years ago near Lake Titicaca, which sits at 3,800 m (12,500 ft) above sea level in the Andes mountain range of South America, on the border between Bolivia and Peru. There, research indicates, communities of hunters and gatherers who had first entered the South American continent at least 7,000 years before began domesticating wild potato plants that grew around the lake in abundance. 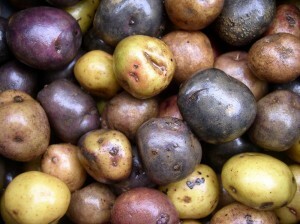 Some 200 species of wild potatoes are found in the Americas. But it was in the Central Andes that farmers succeeded in selecting and improving the first of what was to become, over the following millennia, a staggering range of tuber crops. Potatoes formed the main basis of the Aymara Indian and the Incan diet. Potatoes also influenced the Incan culture, as potato shaped pottery (with even eyes) is found commonly at excavation sites. Also Incan units of time were correlated to the length of time it took for a potato to cook to various consistencies. In the Incan world potatoes were even used to predict the weather. Europeans were not exposed to the potato until the late 1400s and 1500s when the Spanish Conquistadors sacked Peru. When they did not find the silver and gold they were looking for they quickly took over the potato market. From here potatoes were soon a standard supply item on Spanish ships and it was noted that sailors who ate papas (potatoes) did not suffer from scurvy (a disease associated with a deficiency in vitamin C) because potatoes are packed with vitamin C. Though the potato was very productive and hardy, the Spanish did not really embrace it and it was considered a food for the underclass. After Spain introduced the potato to Europe it would take another three decades before its knowledge was spread to the rest of the European nations. Even when this occurred it was only at first mainly cultivated by amateur botanists as a curiosity thing. Resistance to the growth and consumption of potatoes was due to established eating habits, the potatoes reputation as a food for the underprivileged and also the fact that it has a relationship to poisonous plants, being poisonous at times itself. In Britain Sir Walter Raleigh is usually credited with bringing potatoes and tobacco back to Britain, although both of these were already known via the Spanish. Raleigh did help to make smoking popular at court. The potato would not gain true prominence however until the 1780’s when this rugged food crop was adopted by the Irish; who adopted this crop for the prime reason that it could be abundantly produced and was nutritious. Soon after this the potato would gain acceptance across Europe. It would eventually make its way back across the Atlantic to North America with many of those who were migrating there. As time passed and as still follows today potatoes have become one of the world’s major food stuffs. In fact, these oval or often misshapen vegetables are so common in the Western diet that they are often taken for granted. We should appreciate this great food and realize that they have only truly been with us for a few hundred years but have a history and have travelled a journey that none of us would ever repeat. So What was eaten before ? In Europe before Potatoes the majority of meals would have been accompanied with Bread, ever since Roman times (and before that). In some regions crepes/pancakes were also common (e.g. North-West France), or pasta in Italy since the late Middle Ages. It is generally accepted that crisps were originally invented by mistake in 1853 by a native American chef called George Crum. In 1853 George Crum was knocking out fried potatoes with every dish in his restaurant in Saratoga Springs, New York. One day he ended up serving something quite different, a variation on the potato chip, because a grumpy regular, Cornelius Vanderbilt, complained he was fed up that the chips were too thickly cut, soggy and ‘not a nice mouthful’. Irritated, Crum set about making a potato chip that was so thin it couldn’t easily be fried in a pan, nor picked up with a fork. Gleefully he served a plate full of his absurdly thin potato chips to Vanderbilt. But Vanderbilt loved them and, accordingly, Crum added them straight to the menu. To Crum’s surprise they were a huge success. The new crisp not only became a popular choice in the restaurant,- word spread so quickly that the starchy little snack was named the Saratoga Chip. Chip production began in domestic kitchens with family-run businesses distributing them all over the USA. Initially, barrels were used for long-term storage, but chips quickly became bland and stale, particularly at the bottom of the pile. American entrepreneur Laura Scudder persisted in finding a cheap, light container that would seal the snack for ultimate crispness. Scudder made bags out of wax paper and heated them to form airtight seals. Nitrogen was injected to provide a barrier to prevent chips from being crushed and also to extend the shelf life, and this was the first chip packet. A man known only as Carter is reported to have taken the idea of the chip from France to Britain and made them commercially available. But he was usurped by Smiths, who began mass production in 1920. Smiths are still going strong today. And, to be clear, the British call them crisps! 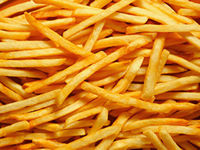 Depending on who you speak to, the French fry originated in either France or Belgium. On the other hand, the French are adamant that it is their invention, and back their claim up with the fact that, writing from the early 1800s, US President Thomas Jefferson mentions ‘potatoes deep-fried while raw’, and that he got the a recipe from his French chef, Honore Julien. On the other hand, Belgian historian Jo Gerard recounts that potatoes were already fried in 1680, in the area of ‘the Meuse valley between Dinant and Liege, Belgium. The poor inhabitants of this region allegedly had the custom of accompanying their meals with small fried fish, but when the river was frozen and they were unable to fish, they cut potatoes lengthwise and fried them in oil to accompany their meals.’ In addition to this, the Belgians sometimes claim that the term ‘French’ was applied to the fries because British or American soldiers in Belgium during the First World War ate Belgian fries and called them ‘French’ because it was the official language of the Belgian army at that time. But the term ‘French fried potatoes’ had been in use long before the war. At the end of the day, it’s a little bit of a mystery which nation came up with the dish, and slightly amusing that both are so precious about a foodstuff that most of us now associate with cheap fast-food outlets all over the world.